Home > Products > Simple Solitaire! CONSUMER ALERT: These products, which are typically available only for high prices on E-bay, are of extremely poor quality and most ASLers would find them more or less unusable. There appears to have been little to no proofreading, rules development or playtesting. See the review of One Wild Ride for a more extended look at one of these products. THESE ARE VERY POOR PRODUCTS; BUYER BEWARE. See entries on Glory & Grief I and One Wild Ride for general comments that would also apply here. Simple Solitaire! (SS) is essentially SASL for the mentally challenged. 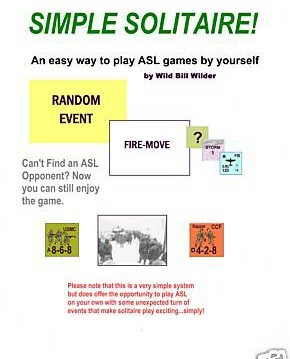 “There are some solitaire modules out there,” designer Bill Wilder explains, but in addition to being out of print, “the ones I have seen seem so complicated that [it] is hardly worth the effort.” Incapable of understanding SASL, it would seem that Wilder decided to come up with a universal alternative that is ostensibly playable with every SL and ASL scenario out there, and uses only 2 pages of rules to do so. 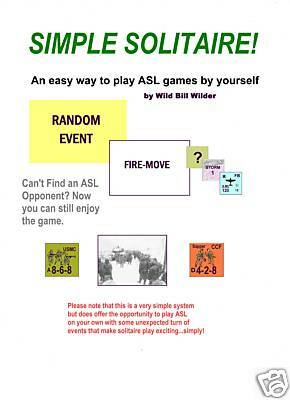 If the rules for Wilder-designed products like One Wild Ride are any indication, Simple Solitaire! is likely to be incomplete and full of holes. Caveat emptor.